China's President Xi Jinping (center) and his wife, Peng Liyuan, stand with Ecuador's President Rafael Correa (second from right) during a welcoming ceremony at Mariscal Sucre Airport in Quito, Ecuador, Nov. 17, 2016. An expected U.S. economic retreat from Latin America under President-elect Donald Trump is causing the region’s leaders to look halfway around the world, to China, for help weathering the possible financial headwinds. They’ll have the perfect opportunity to make their appeal this week when Chinese President Xi Jinping attends a Pacific Rim summit as part of a visit to Ecuador, Peru and Chile. This is Xi’s third time in Latin America since taking office in 2013, and when he wraps up the tour he will have visited 10 countries in the region — the same number as President Barack Obama, who has been in office twice as long. Trump on the campaign trail pledged to break up trade deals such as the North American Free Trade Agreement, deport illegal migrants and build a wall to keep out millions from Mexico and Latin America, sending shockwaves across a region that for two centuries has looked northward for policy guidance. Over the past decade China has displaced the U.S. as the main trading partner in country after country in Latin America as demand for the region’s soybeans, oil and iron ore have fueled the fastest growth in decades. But more recently, as China’s demand for raw materials has been slowing, the region’s economies have taken a hit, dampening the once-torrid love affair with the world’s second-biggest economy. 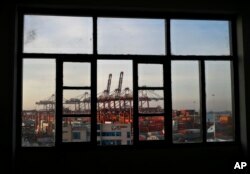 Cranes of the port of El Callao, Peru, are seen through a window, Nov. 17, 2016. Leaders of the Asia-Pacific Economic Cooperation will meet in Lima Nov. 19-20 to discuss the future of international trade policies, growth and improvement of life conditions for more than a third of the world's population. Margaret Myers, a China expert at the Washington-based Inter-American Dialogue, said that most South American countries see the pitfalls of dependence on commodity exports and would prefer closer ties to the U.S., which buys the sort of manufacturing goods that generate more jobs. Some of China’s priorities and growing prowess in the region will be on display during Xi’s trip. In Ecuador, a dollarized-economy that is battling a deep recession, Xi will inaugurate on Friday the country’s biggest hydroelectric dam, which was built by a Chinese firm and paid for with some of the nearly $8 billion lent to the country since 2007. From there he heads to Peru, to attend a summit of Asia Pacific Economic Cooperation group and a meeting with President Pedro Pablo Kuczynski, a former Wall Street investor who nonetheless chose China for his first foreign trip after taking office in July. The weeklong tour wraps up in Chile, which recently opened a branch of a state-run Chinese bank that will be South America’s first clearinghouse for transactions in the tightly-controlled yuan. Elsewhere, in Venezuela, the head of state-run China National Petroleum Corporation on Thursday signed a $2.2 billion accord to jointly boost oil production needed to lift the OPEC nation out of a crisis marked by severe food shortages and triple-digit inflation. While Trump’s victory has all but killed the 12-nation Trans-Pacific Partnership, which would’ve included Mexico, Peru and Chile, China continues to court the region with offers to strengthen existing free trade agreements with Costa Rica, Chile and Peru as well as negotiate new ones with Uruguay and Colombia. In the past decade, China’s two biggest development banks have pumped in $125 billion to Latin America — more than the Washington-based World Bank and Inter-American Development Bank combined.